It is always great to give back to the community if it is information on how to grow your business, giving a 5 dollar tip to the person that pumps your gas, or if you want to donate to a charity of your choice. 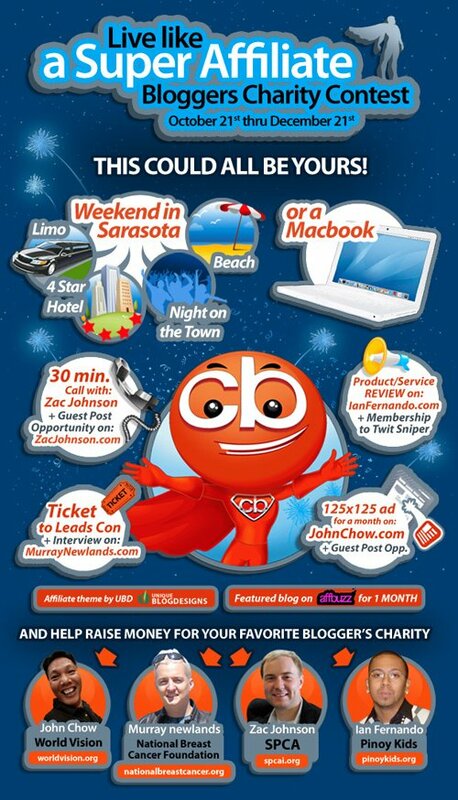 Clickbooth is hosting a contest to help out charities with a new twist to those regular affiliate contests. I am part of this contest and I am glad I am able to help out. The basis of this contest is to help out the charities of our choice, mine being PinoyKids.org. Since 1991, Philippine Children’s Fund of America had been working for these children through partnership with various non-profit agencies. PCFA’s programs and services continue to help more and more children and families out of poverty with educational, medical, health and nutritional components. The title of this charity contest is Live like a Super Affiliate. Again, I am writing this post while I am on the way to San Diego to get away from the Jersey cold weather. It is fairly easy to register and start participating in this contest. We are helping to give back to the community by helping and earning to the charities of our choice. Each affiliate is responsible to send an email to Eric [at] clickbooth.com stating their full name and which of the above task they have completed by December 10th 2009. There are also two additional prizes to be given out. The all mighty Affiliate Theme by Unique Blog Designs and a 1 month featured spot on AffBuzz.com! This starts today and ends December 21, 2009. This contest is only open to NEW publishers. Make sure you register and put in the comment “LiveContest“, if you do not do this then you will not be qualified to participate in this contest. Clickbooth will be donating $500 to each of the charities no matter what, however YOU have the power to help each of us earn an additional $1,000 for our charity. The prizes are amazing and it is for a great cause too. Make sure you register via this unique link and type in “LiveContest” in the comments section.